Drainage water management: Unlike conventional drainage systems, this practice conserves water by increasing its retention time in the soil profile, thereby delaying or reducing the draining of soil water. aturated buffers: These store water within the soil of field buffers by diverting tile water into structures that raise the water table and slow outflow. Early results of a study indicate they can be effective in removing nitrate from tile drain water before it is discharged into surface waters such as streams. 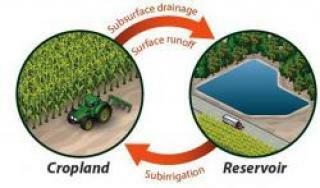 Reservoirs: With this "capture and use" system, subsurface drainage water is diverted into on-farm reservoirs, or ponds, where it is stored until it is needed to irrigate crops.